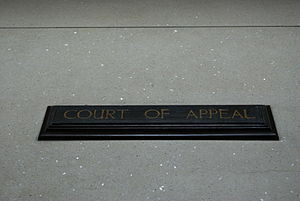 Claimants or defendants will often be dissatisfied with outcomes of judicial proceedings, and seek to appeal. In statist systems, particularly common law systems recognizing binding judicial precedent, the primary purpose of appeal is to maintain consistency between rulings of lower courts. Appeal prevents renegade courts from creating precedent contrary to the will of the highest court. Correcting injustice is a secondary effect, and the dissatisfaction of litigants is merely a motive force. The motivation and operation of appeal is completely different in voluntary law. Judicial precedent does not exist. Uniformity is maintained by the market forces that control the content of voluntary laws. To the extent the law contains ambiguities allowing for different results on similar facts, it is because the people see this ambiguity as a desirable thing. If people want more specificity, they are free to adopt more specific laws. Thus, there is no need for appeal to maintain consistency or develop judicial law. There is no higher court to enforce its will. Voluntary law does not leave the dissatisfied party without options, however,in the case of an incorrect or unenforceable judicial decision. A dissatisfied party’s most fundamental option is to sue the jurist for malpractice. Most jurists would, under market pressure, adopt laws permitting such claims. Requirements for proving judicial malpractice might vary, but in the presence of free and open competition between judicial service providers, such requirements cannot be overly onerous. Reasonable standards might require the claimant to prove a failure of the jurist to comply with a professional standard of care, and consequential damages. The market would determine such requirements, as with all other rules in voluntary law. Another option, in cases where a decision includes a purportedly enforceable judgment, is for the losing party to convincingly show that the judgement is fatally defective and unenforceable, to any and every enforcement service hired to enforce it. Like jurists, enforcement service providers will generally be subject to malpractice liability. Admittedly, redress against or appeals to enforcers may be a less satisfactory option, because it may require repeating the showing to different enforcement services, and might be countered by hiring less reputable, more judgement-proof enforcers. Nonetheless, it will at least raise the cost of obtaining reputable enforcement services to enforce judgements, and may sometimes render judgements entirely unenforceable. Either way, such post-adjudication defense activity would create settlement pressure similar to that created by appeal under statist systems, and pressure for higher-quality juror decisions. In general, enforcer liability is an effective check against unjust judicial decisions, and one almost entirely lacking under statist systems. To reduce risk of malpractice liability, groups of jurists may offer a system of appeal, or other quality control measure, as part of their services. Claimants selecting such service group might agree that judgment is not considered final until all appeals offered by their group are exhausted. Claimants might be willing to bring their business to service providers offering appeal (or perhaps a means of quality control generally accepted as more cost-effective than appeal) to reduce the risk of poor quality, unenforceable judgments. Might claimants choose forums where no appeal is offered as part of the service, to avoid risk of reversal? Perhaps in some cases, but generally only when the claimant is quite confident of their claim, or the case is small. As noted in an earlier post, claimants might tend to select more reputable, comprehensive juror services for difficult or important cases, and cheaper, less comprehensive services for easy or less important cases. Statist systems offer similar options to the claimant, in the form of different general and limited (e.g., small claim) courts. Often, limited courts have corresponding limited or no right of appeal, even in statist systems. Finally, people may choose to adopt voluntary laws that require winning parties to submit to a re-hearing or appeal of a specified type, after a first judgment. Although such legally-granted rights of appeal will necessarily be limited by the principal of reciprocity, they will nonetheless apply in many circumstances. So we can say with confidence that appeal, review, re-hearing, and other quality control measures for judicial process will be present in voluntary law societies, to the extent demanded by the free market.